“This year the Raid would start from Leh and end at Leh,” informed Manjeev Bhalla, organizer of the event. 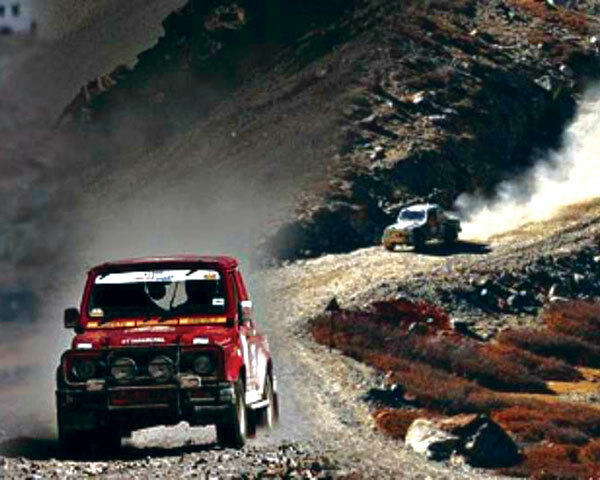 This event started as a small 4 day rally from Shimla to Kaza and reverse in its first edition of 1999. Attributed to the terrain in Lahaul/Spiti and then Ladakh and the adventures enroute the event soon earned reputation of ‘Most difficult rally’ in the country. Loudly advertised by the state tourism every year, the event never left its homeland while planning routes before. Even when the rally was primarily running in areas of Spiti/lahaul and ladakh, a formal start was ensured from Shimla the state capital. “This time the title sponsors are not their so we are organizing the event of our own resources,” said Bhalla. “Though HP government is all support but the route this year is in Ladakh region, and if Himachal Pradesh had to be added then would have added extra days to the event, which was not possible, he explained. With none of the stakeholders in agreement to this we decided to run only in Ladakh region, where logistics were easily workable, he summoned. The state holding its reputation as land of adventure has witnessed highly reputed motorsports events here. ‘The Great Himalayan Car rally (Part of the Asia pacific Championship), London Sydney Marathon, legs of National championship car rallies and many more such premier motorsports events have found abode in this land since early eighties. When these events stopped in late nineties, it was the Raid de Himalaya which kept the adventure tourism graph of the state high. The raid too mostly changed routes every year, but never had the event left its home state. This perhaps would be the only time when the rally is not touching any part of ‘Devbhoomi’. “Director Tourism Rakesh Kanwar said that the Raid is a prestigious event and the government has been always keen to support it. He said that for unknown reasons the event organizers have decided to shift it into J&K this time. Himachal has been a land for adventure activities and shift of an event like this one is indeed a loss, he agreed. “Though it is late for this year, but shall personally talk to the event organizers and try that next year the event returns back to the hill state,” added the Director. Not only the government, are even the natives not happy with this decision. Whereby those with related businesses rue that the action has deprived them the livelihood opportunity. ”When the raid started from Shimla, most transport was hired from the capital, not only by organizers, but also by the support teams of participants, which got us a good volume of business,” stated Satish a transporter. But now with minimal transport being hired from the state, the loss could amount to around 10-15lakhs. Even the hotels and related sector of the city rues the decision. The raid gets around 2000 people from all around in the city. These people include of participants, their service crews, support teams, officials, organizers and media. That creates a requirement of around 1000 rooms for atleast a couple of days. Besides these visitors also involve in eating food, doing shopping and other recreational activities during the stay, informed a travel agent. Clearly the loss would attribute around 30-35lacs for hotels and related businesses of the state,” assumed the travel agent. Before start of the event the participating vehicle have to be scrutinized (Inspected) and cleared by officials. To prepare vehicle for it, teams usually arrived a day or two prior. So last minute technical changes in the vehicles require spare parts/ mechanics and more such logistics. Thus another segment feeling grunt of this decision is the local 2/4 wheeler service, motorbike/car parts dealer who also earned a penny due to the rally. As per sources the event creates a gross turnover of more than 1.5 crore every year. In Himachal Pradesh a large population survives with the tourism business. Though summer and winter seasons do get a lot of visitors here. But advent of events like Raid de Himalaya, MTB Himachal- Mountain biking event, Para Gliding pre world cup, other smaller adventure events especially during September/October months (a comparative lean period), has added a new season of adventure category domestic tourists for the state. So clearly if an event like Raid de Himalaya moves to another state, it could dent the state’s aspiring morals in ‘Adventure tourism promotion’. Next articleTwo of the top 10 MTB riders compete for top rank @ MTB Himalaya.